Planing a kitchen is a fairly complex task because of the many different factors that need to be considered. It is also an area in which strict budgeting is necessary as much of the cost of a kitchen is not in the units, but in the time and cost of the installation process, which of course, this will also depend on how much you wish to invest. Decide what appliances you are going to have in the kitchen. A kitchen should contain a hob and oven, a fridge, and a sink. Other options include a microwave, a dishwasher, a washing machine, a separate freezer, or a combined fridge-freezer. Of course, not all of these have to be in the kitchen – garages and utility rooms can often house appliances. Most food preparation in the kitchen is related to the cooker, the sink and the fridge. Generally a triangular layout of the three essentials is considered ideal – access is straightforward, and there is room for preparation or storage beside each area. It is best not to position your fridge next to your cooker as the fridge will have to work harder because of the warm air around it when the cooker is on. If you want an island unit in your design, it is best if it does not block your route between sink, fridge and cocker. An electrical supply for an island unit can be run underfloor easily, especially if you are fitting a new floor anyway. However, plumbing for an island unit is more difficult because the gradient of the waste pipes need to be accommodated beneath the floor, and this is often impractical in many cases. Storage for food, utensils, and cleaning products is useful in a kitchen. The greater the number of units, the more crowded a kitchen will feel, but too little storage space may be frustrating, so a compromise will usually need to be sought. Worktops are essential for both food preparation and to accommodate electrical appliances such as kettles, coffee makers and freestanding microwaves. Worktops can also provide an eating space, in the for of a breakfast bar, for example. The underside can be left open, or peninsular units can be fitted below. In the latter, a wide section of worktop provides a large overhang. Once you have formulated some ideas about what design and style you are looking for, the next step is to speak to your supplier. The supplier will take accurate measurements of the room and produce a computer-generated design to give you a good idea of what your kitchen will look like. Some manufactures have kitchens in stock, but with others may take weeks or even months to come through. Bear this in mind in overall planning when considering any necessary structural change requirements and re-routing of services. We know how crucial is coordinating the delivery of materials to your project and we advise you to plan well ahead and confirm delivery dates. This layout has units along all or part of two adjoining walls. In a larger kitchen this may allow room for a dining area in the kitchen. This layout provides ample storage space and floor space and is therefore ideal for a busy family life. Here units cover three walls, and in a larger room one length of the U may be used as a breakfast bar. 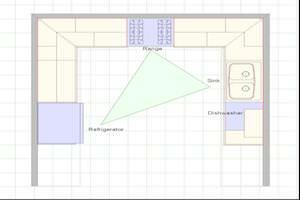 In a small kitchen, this layout provides maximum storage and appliance capacity, but standing room is limited. It is always best to keep the fridge close to the door. This design uses straight runs of units on opposing walls in a narrow kitchen. As in the U-shaped layout on the left, floor space may be limited, but wall space is used to its maximum potential. This type of layout tends to be used either in large kitchens or as a design feature in smaller ones. When appliances are fitted in an island, the “work triangle” theory doesn’t apply. Routing supplies may be tricky with this layout design.